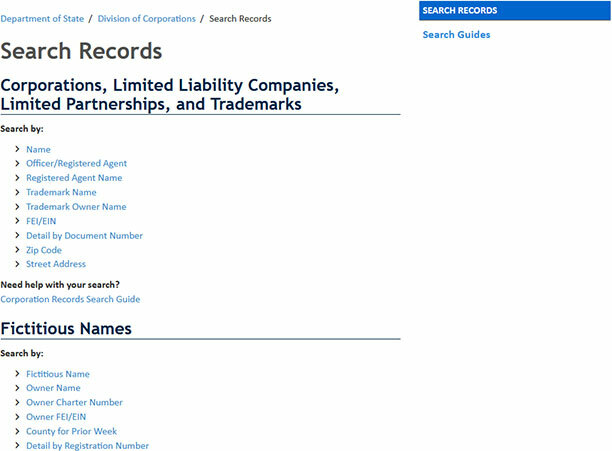 The Corporations Division of the Secretary of State of Florida keeps a database of the records of Corporations, Limited Liability Companies, Limited Partnerships and Limited Liability Partnerships. Any type of entity registered in the state will have its information stored in the database. 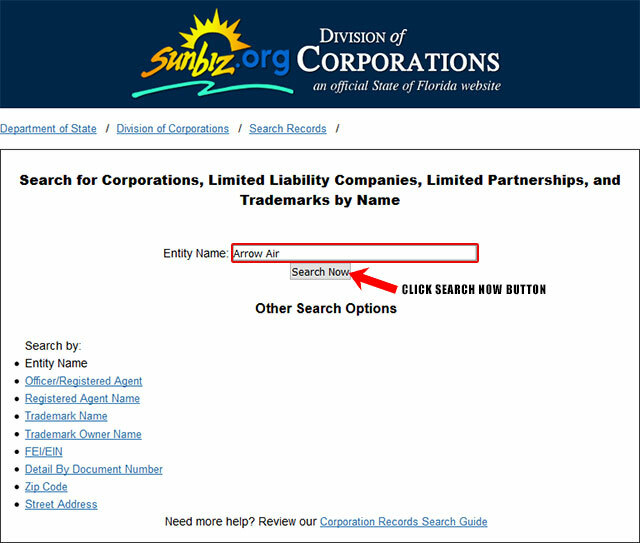 Below is a step by step guideline on how to search for a business entity using the Florida Secretary of State search tool. 1. To access the Florida Business search page, click here. (it will look something like the screenshot below). 2. On this page, under Corporations, Limited Liability Companies, Limited Partnerships, and Trademarks click the Name link to search for a business by name. 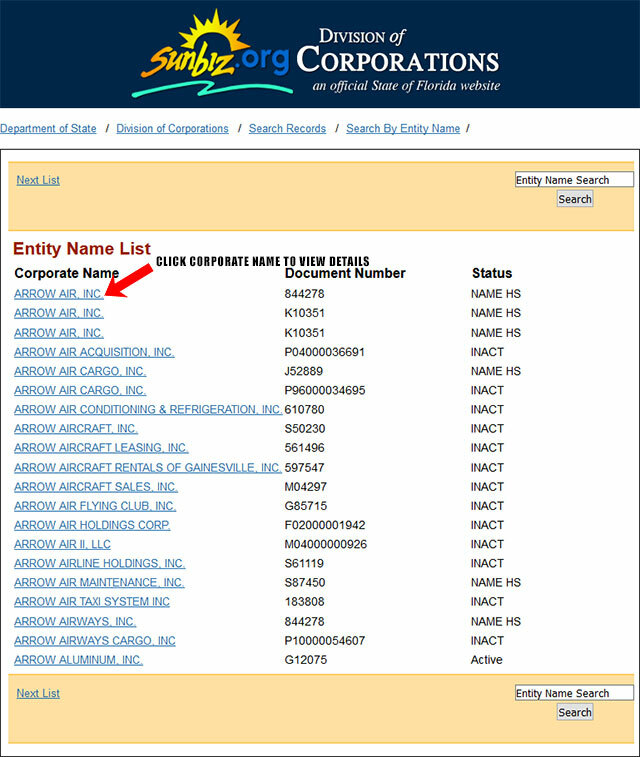 On the next page enter the business name "Arrow Air" in the "Entity Name" field as seen on the screenshot below. 3. Click on the "Search Now" button. The next page will show a list of entities named "Arrow Air" along with their Document Number and Status. 4. When you click on one of the entities, you will get advanced details such as their Filing Information, Address Details, Registered Agent, etc. 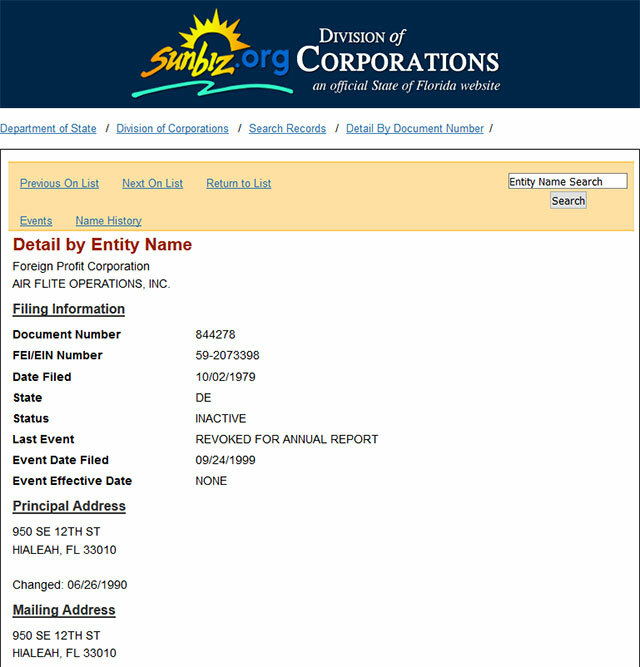 You can also access the Annual Reports of the entities if you scroll down the page. In this case, the results are for "AIR FLITE OPERATIONS, INC."
There are also files of the entity that you can download for more information. Apart from giving information regarding the registered entities, the official website of the Secretary of State provides easy filing options to form businesses or file reports (you can download the forms or complete them online). It should be noted that while most of the services and downloads are free of charge on Florida's SOS website, there are some downloads which have associated fees. 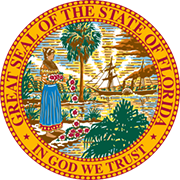 The Secretary of State of Florida is the keeper of the Great Seal of the state and is responsible for all the prime governmental duties of the state. He is Chief of Elections, Chief Cultural Officer, the State Protocol Officer and the head of the Department of State.